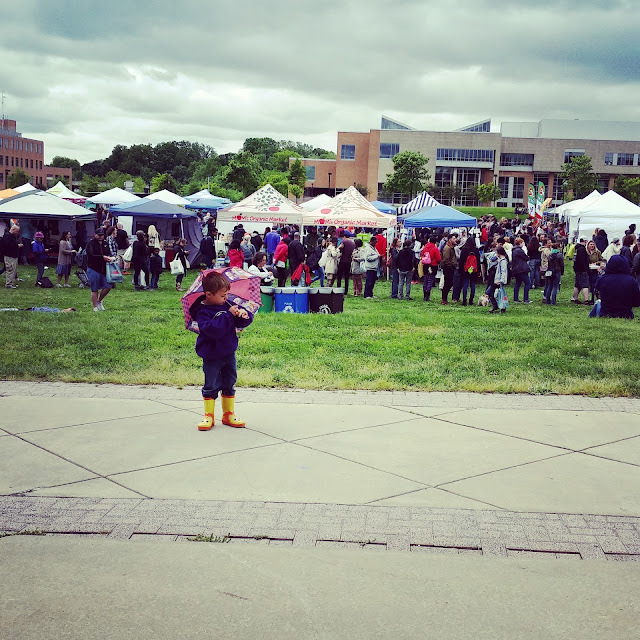 We had so much fun at last years Baltimore VegFest that we trekked out there again this year. My nice husband dropped us off so we could be near the front of the line so we'd get our gift bags. Those suckers were jam packed, so it was worth waiting in line for over a half hour. As usual, the line got super long. There is plenty of free parking, but unless you want to be stuck in Guam, get there early. My daughter, the profession photographer wanna be, took a bunch of random pictures. I wish she focused more on the booths like I asked...I think I'll start bringing my own camera...but all in all I think she did a great job, but of course, I'm biased. There were plenty of organizations there raising awareness for their organizations. These two cuties are from the Baltimore County Animal Shelter. Someone please adopt them! We ate some great food, including the same falafel and ginger lemonade like we did last year, it really is that good. Plus, it's the best value. It's gigantic! And only $10. We also got a delicious vegan hot dog and a couple of vegan samosas. Quorn is coming out with some vegan options. The chicken was so close to chicken it was crazy. Even though we picked up a lot of free swag, but bought some stickers, pins and t-shirts. This was some good coffee! Brewing Good is a bird-friendly coffee brand. Didn't know that was even a thing! Definitely, something I need to learn more about. We have a list of VegFests we're attending this year. Hope we see you there!